Episode 1 : "Showing The Flag"
The Sgt Major attempts to show the Concert Party the ancient ceremony of lowering the Union Jack at sunset, which doesn't go well at all. He even tries to get Lofty to play the last post on the bugle, if he could play the bugle that is! Episode 2 : "Down In The Jungle"
The concert party are on their way to a performance in the jungle, much to the Sgt Majors pleasure. The plane they are travelling in has to make a crash landing, but they fear they may be beyond enemy lines. They eventually capture the enemy, who turn out to be waiters at a Bombay restaurant, just 5 miles away! Episode 3 : "The Natives Are Revolting"
The Sgt Major is incensed to find the natives have taken down the Union Jack and replaced it with the Indian flag. He tries to find out the culprit, but fails. He ends up tearing the flag into pieces, but ends up having to apologise, but finds that he can't do it. The Concert Party do it for him in their own inimitable style, a performance. Episode 4 : "Cabaret Time"
The Sgt Major discovers that if the Concert Party performs at the Karma Sutra club in Deolali, which is out of bounds to the military, the men will be court marshalled and probably sent up the jungle, so he cons them into doing a cabaret there. Solly already knows the place is out of bounds, so they go in disguised as MPs, but the cabaret is a disaster. The Sgt Major turns up wanting to witness their arrest, but the real MPs turn up whilst he is there, dressed in his military uniform. The rest of the gang have there MP disguise to get out of the club in, but the Sgt Major has to dress in a clowns costume to avoid arrest. Episode 5 : "The Curse Of The Sadhu"
Episode 6 : "Forbidden Fruits"
Episode 7 : "Has Anyone Seen My Cobra?" Whilst rehearsing a forthcoming number including a snake charmer the Concert Party are interrupted by the Sgt Major who kicks out the snake charmer and accidentally lets the Cobra out. 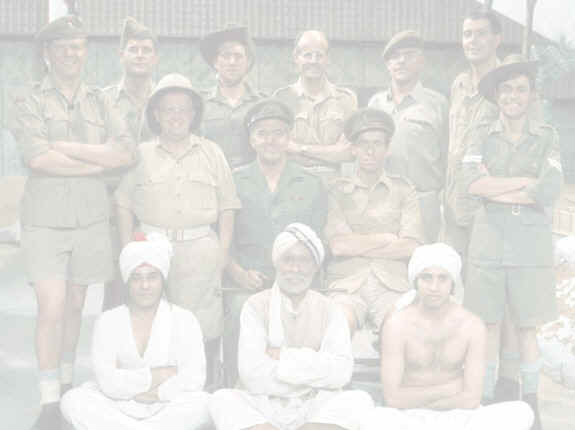 The gang do a frantic search for it, but it ends up in the Sgt Majors hut, where he is messing about on the snake charmers pipes, which he confiscated. It reveals the snake and he has to keep playing for all he is worth. It ends up where there are 2 snakes. The Concert Party, The Colonel and Captain Ashwood all arrive with guns to kill the snakes, and in the process, end up putting loads of holes in the Sgt Majors new suit. Episode 8 : "The Night Of The Thugs"